Earn $94.99 in Rewards credit (9499 points) What's This? Ever lined up at the start line knowing this race is in the bag, only to find out you are desperately under geared? With the EC90 SL CINCH Power Meter Crankset not only do you get industry-leading versatility, making on-the-fly 1x or 2x drive spider changes easy, you also get spindle-based power measurement delivering precise, reliable data to your smartphone or ANT+ head unit. Designed around the EC90 SL Crankset, Easton did away with the standard crank spider and ensuing spider-mounted chainrings of old. Utilizing Race Face's Cinch technology, this crankset uses Direct Mount 1x or 2x spiders, dropping grams and eeking out every last watt that you generate. This revolutionary new design makes fine-tuning your 1x setup to suit the course after a pre-ride, or converting your 'cross bike to a winter road bike at the end of the season as easy as a few turns of a wrench. While the lightweight and versatile crankset is revolutionary in its own right, the real game changer is the CINCH spindle-based power meter. 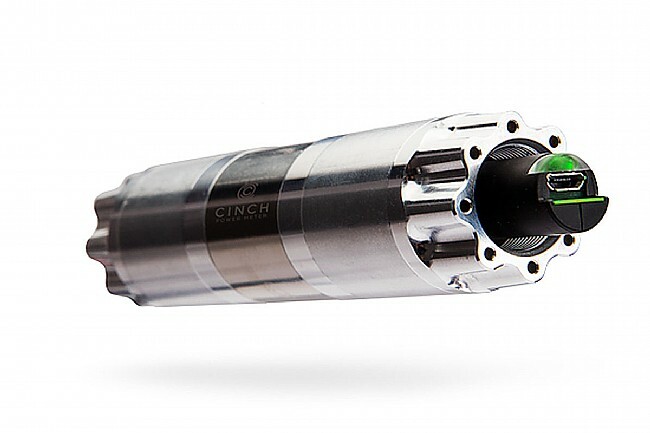 Housed inside the 38mm alloy spindle, the highly adaptable CINCH system boasts a 400+ hour battery life while only adding on 65g to the crankset's weight. With dual Bluetooth transmission and an ANT+ radio to connect to your head unit of choice or smartphone, see your power, cadence and pedalling efficiency data in real time. 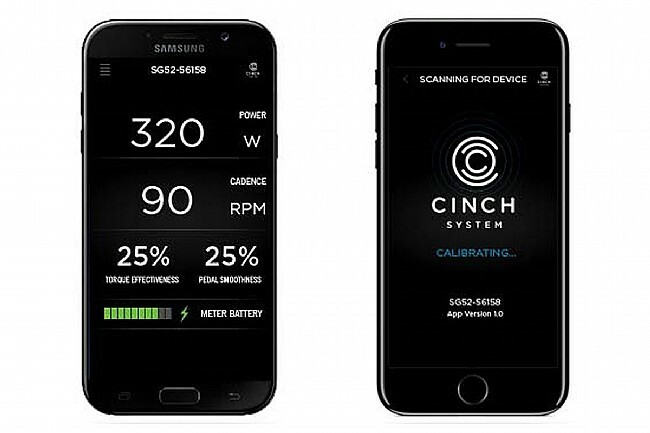 With the CINCH Smartphone app, check your battery levels, install updates, and calibrate your power meter all on the fly. 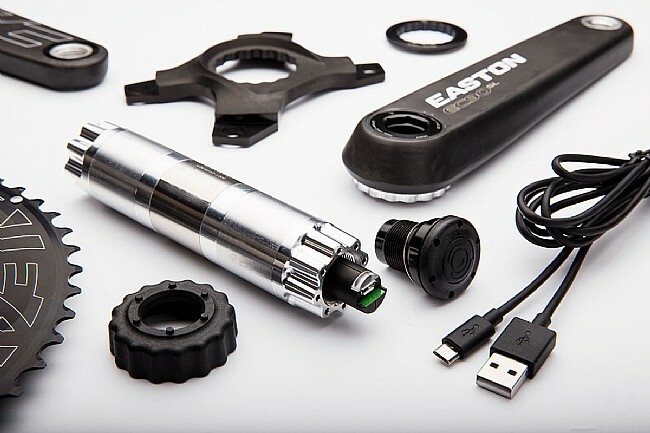 Includes Easton CINCH Power Meter Spindle and EC90 SL Crank arms, CINCH Power NDS Crank Bolt Adapter, 8-16mm Hex Adapter, CINCH Crank Extractor, Antenna Cap Tool, Micro USB Cable. Direct Mount rings and bottom bracket not included. Compatible with: BB86, BSA 68mm, PF30 68mm, BB30 68mm, BBright, or 386Evo. Another follow up from my last two reviews. My replacement power meter did great upon first charge and use with just over 1500 mi before needing a recharge. However, the next cycle only lasted 500mi, then 500mi again. Then it dropped consistently lasting only 100-200mi between charges. Other than the batter performance, the meter has worked great. I was at 2400mi total, when I returned the power meter to Easton and they sent me a new one via warranty. It took a little over 2 weeks. I was told a capacitor on the chip had gone bad. So, Now I am on my 3rd one, hopefully it will last this time. Follow up long term review. Just a quick follow up on my first review. My replacement power meter has been working great. The battery life has been exceptional, Im trending towards 1000mi on a charge. Every now and then, it would take time to wake when in sleep mode (a few miles), but the latest firmware seems to have fixed that. The power meter is working well. Ive replaced the chainrings with Praxis cold forged rings and have not had issues with dropped chains any more. Inspecting the teeth, these new rings have slightly taller teeth, so it may be more an issue with chain retention than ring flex. My Shimano rings have similar height teeth as well to Praxis. The slightly shorter Easton teeth may allow the chain to walk off the ring when at extreme angles and high torque. So overall, Im pleased with the crank and meter now, but chainring teeth profile may need more optimization. Mixed feelings, good product that could use stiffer rings. There are not very many reviews on this Easton Power Cinch double crank. I took a dive and decided to go for it. I have used the standard non power Cinch crank with an Easton 1x ring and it is a fabulous product. The rechargeable spindle mounted power meter seduced me the most. Having used another brand power meter for a good number of years on multiple bikes, the thought of not having to keep adding to my pile of coin cell lithium batteries was appealing, let alone dreaded dead batteries due to water infiltration and what have you. The advertised battery life is stellar, but what will the real world experience be like? So here we go. Mechanically, the crank arms and spindle and as awesome as the standard, essentially the same. The spindle has a central cover assuming there is some sort of torque load cell there. Mounting was a breeze, charged up and connected via Bluetooth quickly to my iPad to update the firmware. The Easton account and login (required for updates) was a bit hard to figure out at first, but once in, it an issue. Calibrated quick and the meter seemed accurate and work well for a few months using ant. Then sometimes during rides, the meter would read zero for a few minutes. Maybe twice during a ride it would do this. It would say connected but would read zeros. If I forgot it and tried reconnecting, it would not pair, and tried Bluetooth with different rates of success. Then a bit later as the rains of autum set in, the battery started to drain quickly. It would go dead after a few days. Every time I charged it, it would do the same. It would work while it had juice left, it just would not last but a few days. Then some days it would read power level that seemed off. Something was definitely wrong. I recorded the battery history for a few weeks and contacted Easton and shared my data. They replaced it with a new spindle, and its been working great since. I have yet to run the battery dry, it lasted a few months before the original started going bad, and the new one is still going on a few months, but at the rates they have been wearing down, it seems like they will last a good long time. I purchased a second one, and has been working fine.